Keep your horse from becoming a hot mess after your ride with this six step cool-down routine. It’s not hard for both you and your horse to work up a sweat while you’re riding. A horse’s body temperature is 99 to 100 degrees Fahrenheit. As he exercises during your ride, his body temperature increases—which is natural—but if his temperature increases too much, it can be dangerous for his health. In hot weather and in cold, bringing down the temperature of your horse after a ride is super important. 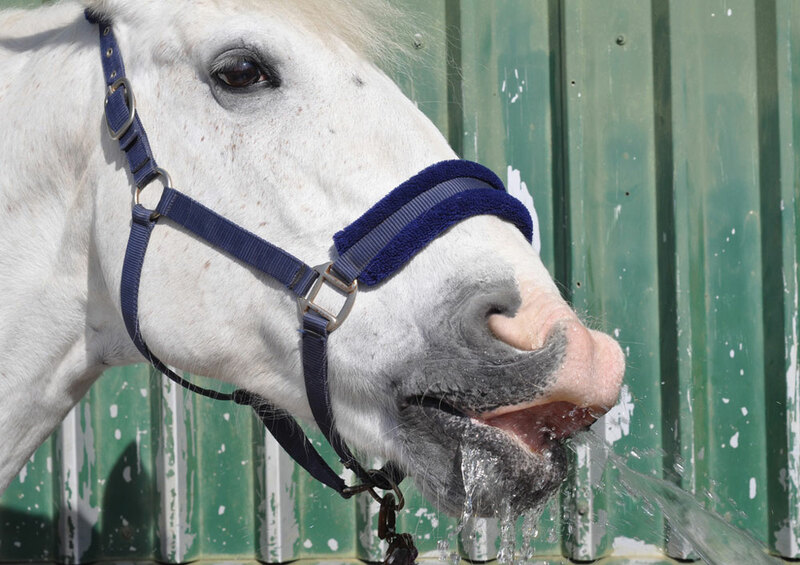 Janet Johnston, DVM, an emergency and critical care veterinarian at the University of Pennsylvania School of Veterinary Medicine’s New Bolton Center, offers these six steps to cool down your horse after a ride. Just like you warm up for your ride by walking and stretching, cool down in the same way. “Especially if it’s hot and humid, plan for a period of time—10 to 15 minutes—at the end of your ride or training session to gradually slow the work and cool down,” says Johnston. Find a cool, shady spot to untack, whether in the barn or under a tree. “A fan or breeze can help keep air moving to encourage [sweat] evaporation,” says Johnston. If your barn has a misting fan, that’s even better in hot weather. Think about what’s in sweat—it’s water! Both you and your horse need to drink enough to replace all the water lost during the ride. 4. Hose or sponge your horse. If your horse is very sweaty and it’s not cold outside, a bath will feel good for your horse. 5. Use a cooler if you need to. In chilly weather, your horse might benefit from a breathable wool or fleece cooler as his sweat is evaporating. Finding the best cool-down routine for your horse might take some time. Just like people, some horses bounce back quickly and are ready to move on with their day, while others need more care. Coat color and fitness level matter, too. Johnston says lighter-colored horses, horses that are more fit, and smaller-framed horses will heat up slower and cool down faster. Then you can bring your horse back to the barn or pasture and thank him for a good ride. Sweating is how horses (and humans!) move heat out of their bodies. This evaporative cooling takes heat away from the skin as the sweat evaporates. A horse sweats out 70 percent of his excess heat during and after exercise. You can help your horse with this process by following a simple cool-down routine. If your horse gets a thick hair coat as the weather gets chilly, you may need to try additional cool-down tricks. Your horse’s hair coat is fluffy to trap warmth against his skin. When the hair is wet and matted down, it doesn’t have air-trapping abilities. Rub sweaty spots with a towel to help them dry and bring back the coat’s fluff. You don’t want your horse to get chilled while his coat dries, so place a cooler over him—or even just a towel over the wet area will do. If your horse wears a blanket, don’t bundle him up again until he is cooled down and dry. Covering a wet horse in a blanket will make the sweat take longer to dry, making your horse uncomfortable and setting him up to get the chills. This article originally appeared in the September/October 2017 issue of Young Rider magazine. Click here to subscribe!